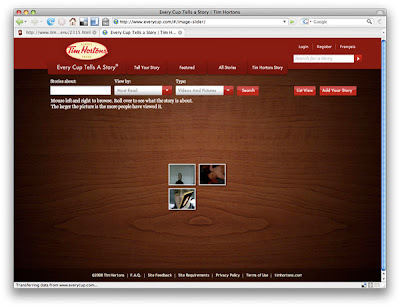 I've always considered Tim Horton's to be a Fast Food place, but apparently they're primarily players in the coffee market. I guess I make too many assumptions based on a drive-through window and turkey sandwiches with a cup of soup. I can't find anything with a date on here, so I'm not sure how long this has been up. 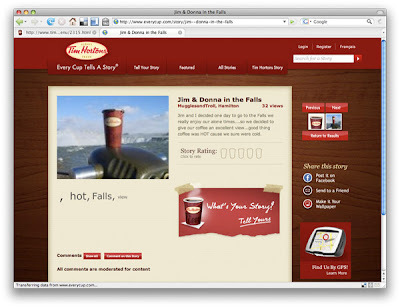 You probably can't read it - but it's basically "Me and my husband went to the Falls and got a cup of hot coffee because it was cold." I started this blog with the intention of being objective, but it's turning out to be really tough. Instead of any more snide comments, I'm going to just talk about what's wrong. The single key thing that is wrong here is that the site is inclusive. It's making the same mistake most of these types of sites make. It's trying to be it's own little Social site, with all the tools the big channels have, but with 1% of the traffic. If you want this to work, you must use the bigger channels, the YouTubes, Facebook, Myspace, etc. The biggest step you can take with your product online is being honest with yourself. Field of Dreams was a movie. 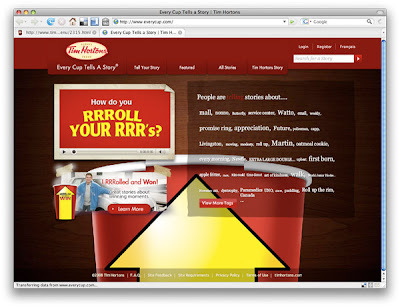 Last thing on Tim's site, you can download the GPS coordinates of all Tim Horton stores. Er.